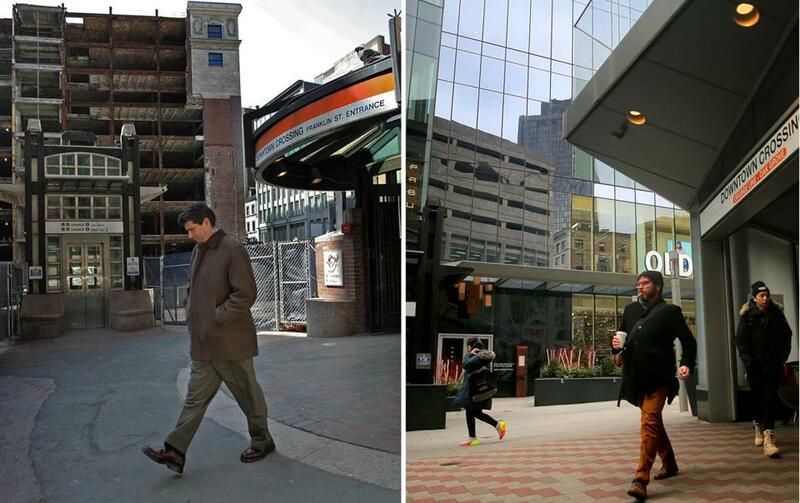 Left: A man walked through Downtown Crossing in 2009. Right: The scene at Downtown Crossing today. If you’ve perused social media at all lately, then you’ve seen just how much (or how little, if they’re lucky) that’s true for people. As part of yet another online trend, users on Instagram, Facebook, and Twitter have been posting side-by-side photographs comparing what they looked like 10 years ago versus what they look like today. Called the “10 Year Challenge” — it has also been dubbed the “How Hard Did Aging Hit You” challenge, among other names — the craze has become almost inescapable, with everyone from your old college roommates to celebrities like Padma Lakshmi getting in on the action. But people aren’t the only ones who change — and they’re certainly not the only ones sharing about it. Among those who’ve posted about the challenge are the Cambridge Police, TD Garden, and a promotional account for the Seaport District, all of which showed off the progress they’ve made since roughly 2009. This, in turn, got the Globe thinking: How has the face of the city transformed in the past 10 years or so? It used to be a giant hole. Now, it’s among the tallest buildings in the city. Millennium Tower, a gleaming 60-story structure, was finally completed in 2015, backfilling the long-empty space where the Filene’s department store once lived. Along with it came a new outdoor seating space and entrance to the MBTA. It took five years and a few delays, but the Longfellow Bridge that connects Boston to Cambridge over the Charles River finally reopened in June — and with it came some upgrades. The $300 million reconstruction project included sprucing up the famous “salt-and-pepper shaker” towers that stand guard over the century-old bridge, while at the same time expanding space along the structure for pedestrians and cyclists who travel across it. Although the Longfellow underwent a bit of a “glow-up,” so to speak, one thing resisted the transformation: The mysterious trophies that line the beams beneath it. What was once an almost-barren stretch of parking lots, dotted with a few restaurants and bars, has become a neighborhood known for its reaching glass buildings and luxury apartment complexes, massive developments that seem to surround visitors from all sides. Billed as “Boston’s youngest neighborhood,” the Seaport has undergone perhaps the most dramatic change of any area in the city — albeit one that has faced some challenges in its short existence. Coincidentally, the Rose Kennedy Greenway, a series of parks studded with artwork and places to relax, is celebrating its 10th birthday this year. The winding, spine-like outdoor space took the place of the elevated I-93 highway, and connects the North End to Chinatown. Get ready, sports fans, because there’s a major expansion underway at TD Garden: a 50,000-square-foot project complete with a flashy new entrance, upgraded concessions, and much more seating. Add to that the adjacent “Hub on Causeway” development — 1.5 million square feet of mixed-used space with two towers — being built on the old Boston Garden site. Oh, and don’t forget the new pedestrian tunnel under Causeway Street. Unfortunately, some things remain the same after all these years. But, there’s hope on the horizon! A fleet of new Red Line trains is on the way, with the first new cars expected to enter service in late 2019, according to MBTA officials.